Injectable local anesthetic Xylocaine 2%, in a 50mL multi dose vial. 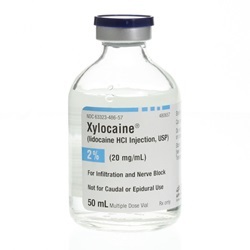 Generic drug name is Lidocaine HCl. NDC: 63323-0486-57. Manufactured by Fresenius. Comes as singles.